Getting Perspective: The Emory Global Health Institute has provided funding to several programs in Haiti, including an effort to identify and offer help for depression in communities that have been ravaged by natural disaster and social conflict, but have almost no resources for mental illness. 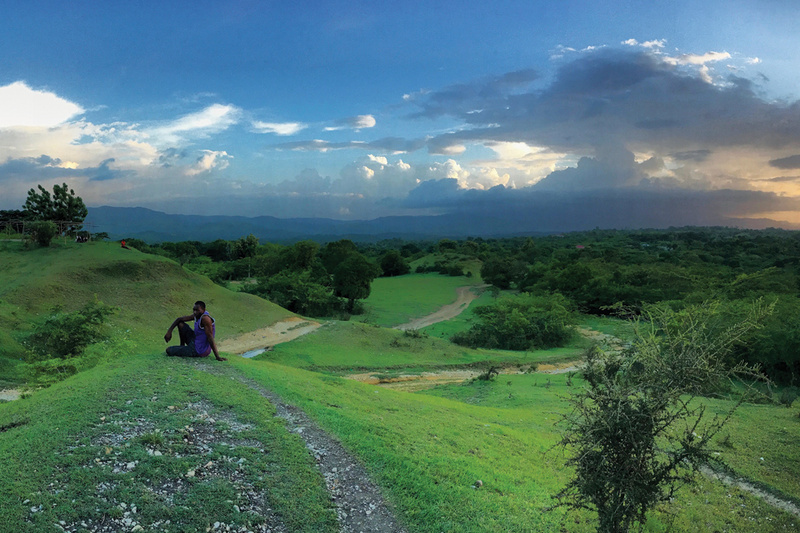 This photo by Emory medical student Jesse Rappaport, taken outside the town of Hinche, was one of the 2016 winners of the EGHI Global Health Student Photography Contest. The little boy died at home, without medical attention, before his fifth birthday. It happens to as many as one in five children in poor African and South Asian countries. The boy was deeply mourned, but never counted. His death was not noted in any registry. Except for a fever, no one had any idea why he died—information that might have been lifesaving for family members, or helped health officials recognize and address a widespread problem, or been the earliest indication of a smoldering epidemic. "While we would think we have a pretty good idea of why children are dying—respiratory disease, enteric infections, fevers, and sepsis from different microorganisms—we don't know those specific causes," says Jeffrey Koplan, former director of the CDC and now Emory Vice President for Global Health and EGHI's founding director. "There are a lot of different things that can cause respiratory failure. A lot of illnesses can lead to gastroenteritis and then death. The objective of this grant is to identify the specific causes of death so that we can develop programs to address them and save lives." CHAMPS is big: A $75 million investment for the first three years of a projected twenty-year study, involving hundreds of partners at field sites and programmatic support from Emory, the CDC, and other Atlanta-based and international partners. But EGHI was created to serve as the mainframe for just such large-scale, long-term efforts—whether addressing high rates of maternal and childhood morbidity, understanding the spike of diabetes in developing nations, or increasing access to safe water. Borders don't mean much to infectious diseases, from shape-shifters like HIV and drug-resistant tuberculosis to sudden outbreaks like Ebola, SARS, or Zika. Chronic problems like diabetes and cardiovascular disease no longer belong primarily to richer, fatter nations but take an increasingly heavy toll on the economic stability, development, and even national security of developing nations, all with global impact. Founded ten years ago as the flagship program to expand Emory's commitment to global health, EGHI is its own entity, university-wide, not part of any individual school. The organization is deliberately compact—a staff of ten, a cluster of offices, no big signs on the door. But its design—pragmatic, strategic, multidisciplinary, partner focused—gives it maximum flexibility in how to identify and tackle problems. EGHI's framework may be lean, but its ambition is big and its reach is wide, starting right on campus. 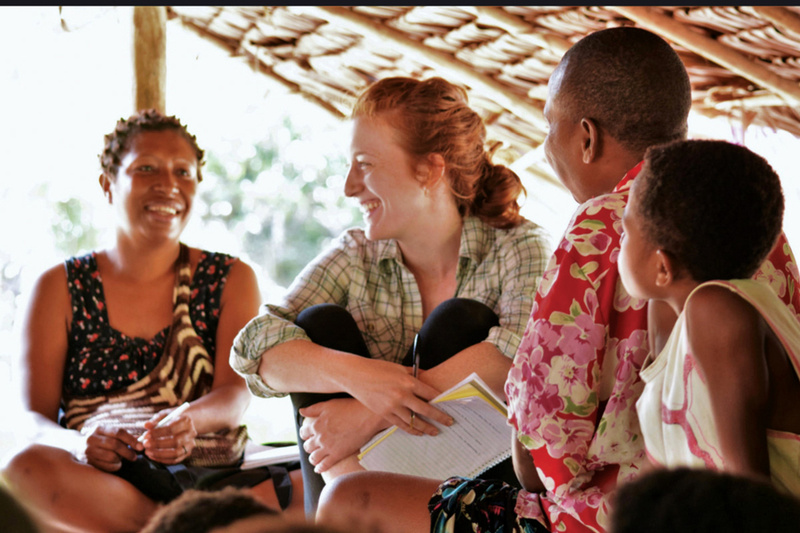 When philanthropists invest in EGHI, the institute invests in faculty with the expertise to create lasting change. Currently some two hundred highly multidisciplinary faculty members, representing every college across campus, are involved in EGHI projects in more than a hundred countries, working, by policy, with global and local health partners. Sometimes that investment means providing early support to Emory faculty with innovative ideas and to pilot projects ready to prove their value and earn the attention of funding agencies or foundations. When Emory's Center for Global Safe Water, Sanitation, and Hygiene (WASH) was just getting off the ground in 2006, EGHI gave it a $600,000 grant from its own start-up money. WASH Director Christine Moe says the funding was timely and critical, allowing her to hire people and develop programs that expanded rapidly, garnering external support. For example, an early, small-budget project looked at how parasite-destroying solar latrines and easily assembled "toilets in a box" would be accepted in Bolivia, the country with the lowest sanitation coverage in Latin America. That gave faculty and students valuable experience and impressed the Gates Foundation. Today, with forty-five faculty and staff, WASH is one of the few global health groups in many highly populated, low-income cities where most people in the developing world now live. "That EGHI seed funding has really allowed us to become global leaders in sanitation research," Moe says. "There's nothing more fundamental to public health than water sanitation and hygiene. It touches almost every aspect of quality of life and health. If people have water for agriculture, for drinking, for business, and if it's convenient so that they can spend their time doing economic activities and caring for their children rather than spending hours every day fetching water, it's fundamental." Drop in the Bucket: These young cousins in rural Sierra Leone are among millions of women and girls who spend hours each day toting water for their families. 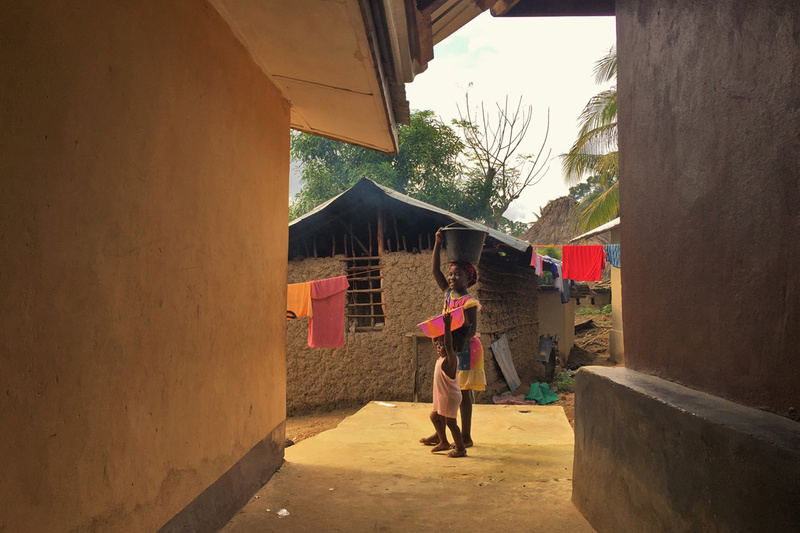 Programs like the Center for Global Safe Water, Sanitation, and Hygiene, initially supported by a startup grant from EGHI, are helping to lighten the load. Photo by Rebecca Wee, RSPH, Global Health Student Photography Contest. Sometimes EGHI stakes an individual faculty member, with resources not bound to any single idea. That vote of confidence persuaded Saad Omer, now William H. Foege Professor of Global Health, to join Emory. Omer says the unrestricted nature of the opportunity allowed him to "go after ideas a little ahead of their time," such as looking at whooping cough rates among Pakistani children too young to be vaccinated and evaluating whether women vaccinated while pregnant transferred protective antibodies to their babies. The project won national honors, and today his work in vaccine effectiveness and safety operates with the support of external grants many times larger than EGHI's initial investment. Seed money also made a difference to Thomas Gillespie, associate professor and director of graduate studies in Emory's Department of Environmental Sciences, and a Global Health Institute Faculty Distinction Fund Awardee. When Gillespie joined the department, people were starting to recognize the importance of the interface between animal health, human disease, and changes in the environment, but research on these issues fell through the gap between the usual funding sources. EGHI stepped into that gap. One study showed how changing forest structure through logging in a region of Madagascar altered mosquito-breeding habitats, increasing malaria among local peoples. It was the first empirical data in the new field now called One Health. External funding suddenly got easier, and donors helped Gillespie set up a nongovernmental organization to provide effective health care in Madagascar. EGHI has a track record of small, strategic investments winning big support from deep-pocket visionaries like the Gates Foundation, governmental agencies, and private donors. The institute has a $14 return on investment for every dollar it spends—money it ploughs back into its work. The goal is twofold: immediate change and lasting solutions. EGHI works in partnership with the people on the ground who know the problem and cultures best: ministries of health, nongovernmental organizations, universities, and other local leaders. Together, they design the infrastructure, programs, knowledge, and training that countries need to manage immediate and future health problems. "Thanks to Emory's vision and support, and to Jeff Koplan's leadership, EGHI has become a world-class program, setting the pace for many of the critical global health issues of our time," says Robert Breiman, another CDC veteran who took over as director in 2013. "It's exciting to see our faculty generating creative ideas every day. It means that, for all of EGHI's successes, we are still in the early phases of the global impact we can have." 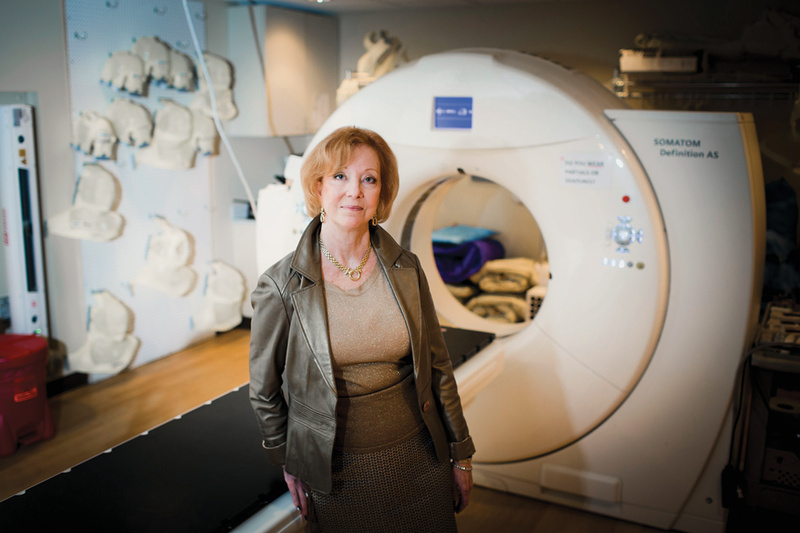 Emory President Claire E. Sterk, herself an internationally known public health researcher, says that over the past ten years, she has watched EGHI grow into its early promise, bringing innovation to the field of global health. "Today, global health challenges are so complex that to make advances we must take a cross-disciplinary and cross-cultural approach and work together with local partners," Sterk says. "The EGHI has done just that by helping countries develop their own strengths and working with students across a wide swath of disciplines to prepare future leaders." Going forward, Sterk adds, "Bringing together university- wide connections with partners can create an epicenter for global health innovation in Atlanta. That in turn can spread across the globe to have a significant impact on lives." Next Generation: The EGHI has helped send more than 1,700 students to work on projects around the world, and organizes annual Global Health Case Competitions where students learn to develop multidisciplinary solutions. The heaviest burden of type 2 diabetes has shifted. Four of every five people with the disease now live in low-income countries. India has more cases than anywhere, and K. M. Venkat Narayan believes that's where to find answers about treatment and prevention, especially in Asia and sub-Saharan Africa (and for 40 million Americans with that ancestry). EGHI funds helped the internationally recognized expert establish a population-based diabetes center with colleagues in Madras, leading Indian public health organizations, NIH, United Health, and private donors to offer $40 million in support. One center program follows fifty thousand healthy people, tracking diet and other behaviors, watching who develops diabetes. The study already has produced surprises. In India, a fifth of diabetes patients are underweight, perhaps because early malnutrition damaged the pancreas's insulin-producing ability. Fifteen new clinics, established in partnership with local universities and ministries of health, enable additional research on treatment, including the country's largest study on preventing complications. And a network of one hundred fifty American and Indian investigators, funded by NIH and Fulbright, is taking international collaboration to new heights. In 2008, EGHI attracted tobacco control expert Pam Redmon to use her knowledge and experience in reducing tobacco's toll on health in China, the very epicenter of the global tobacco epidemic. China was losing three thousand people daily—a million per year—from smoking and secondhand smoke. Smoking was the norm, and without change, the death rate was expected to triple in twenty years. With modest startup funds, the EGHI China Tobacco Control Program was born, laying the groundwork for the Gates Foundation to provide a $14 million boost. The National Cancer Institute, China CDC and the Think Tank Research Center for Health Development, led by three former China CDC heads, joined in. The program helps governmental health agencies in twenty-two cities bulk up staff assigned to antismoking efforts. Seventeen cities, the first out of the gate, all have adopted smoke-free policies within sectors like schools and hospitals, and six now have smoke-free public places. Cessation efforts include clinics, text reminders, and help for new parents in creating smoke-free homes. In 2012, EGHI and the Marcus Foundation provided Emory College's Gonzalo Vazque-Prokopec $47,000, enough to build a small but innovative mosquito control program in Mexico. He was focused on dengue fever; Zika, carried by the same mosquito, would not emerge as a global health crisis for another year. By the time it did, causing devastating birth defects across the Americas and Asia, Vazque-Prokopec had become an expert on the aggressive, daytime-biting Aedes mosquito. He found that mapping neighborhoods at highest risk of infection, then spraying only the parts of the house where the mosquitos hung out, was as effective as traditional spray-everything-everywhere methods, but a lot faster and cheaper. When Zika struck, the National Science Foundation and CDC looked at these results and provided him and his Mexican colleagues $1 million to expand the work, fighting Zika and preparing for the next vector-borne health threat. "Emory is unique not only in the capacity we have as a group of faculty and researchers, but also in our ability to interact," Vazque-Prokopec says. 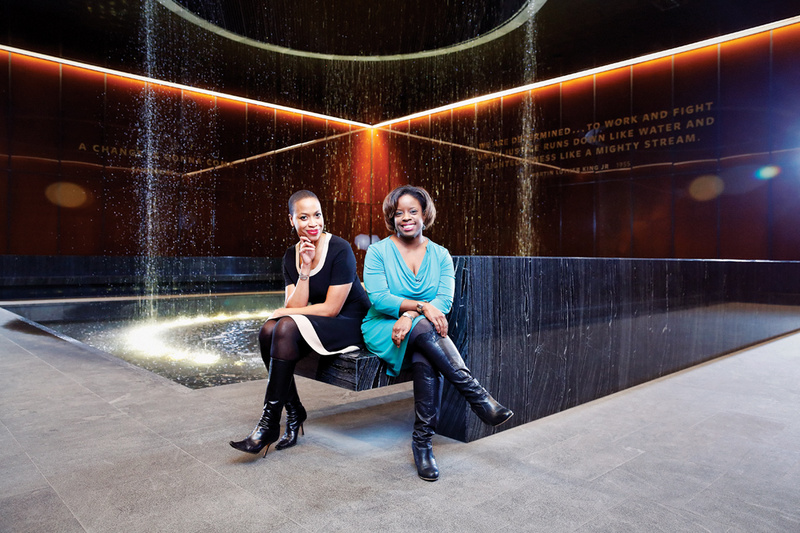 "And I think what EGHI has done is facilitate those bridges in order to make it happen." Ethiopia is one of five countries accounting for half of all maternal deaths. Taking advantage of existing collaborations in Ethiopia, EGHI negotiated a grant from the Gates Foundation. Professor Henry Blumberg asked Ethiopian colleagues what serious problem affected pregnant women during pregnancy and childbirth—for which $100,000 could make a difference? Eclampsia, pregnancy-related hypertension, is the second-leading cause of maternal death in poor African nations (after postpartum hemorrhage). Standard treatment reduces the risk by half. Magnesium sulfate is very safe, very cheap—and very unavailable in Ethiopia. Thanks to the grant, it was distributed to all 107 public hospitals. EGHI funding also has supported new efforts to stem cervical cancer and newborn deaths in Ethiopia. On the Ground: One of the guiding principles behind EGHI projects is a commitment to lasting solutions, not quick fixes. That means working with local communities, health organizations, and government agencies to build infrastructure and capacity. 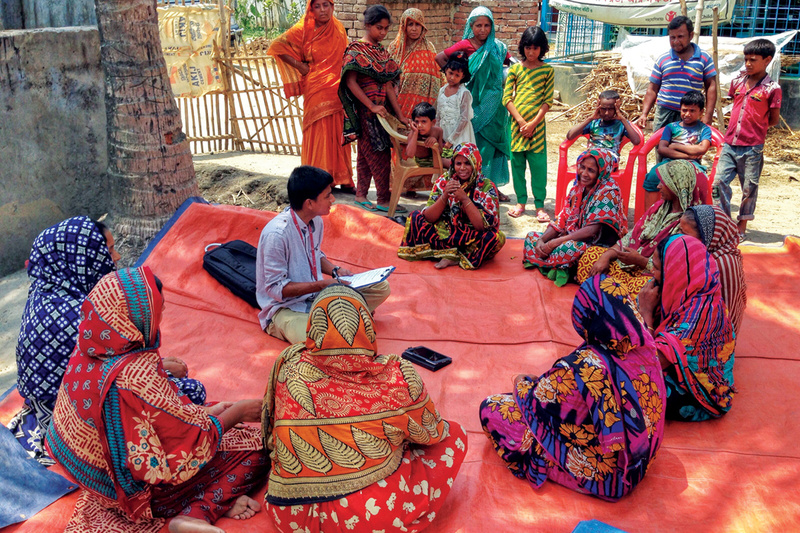 Above, women of the Meherpur District in Bangladesh gather for a focus group to assess their perceptions of an arsenic-filtering water treatment-plant implemented in their community. Photo by Anushree Mahajan, RSPH, Global Health Student Photography Contest. Without a strong public health infrastructure, how can any country detect, track, and respond to disease outbreaks, much less chronic disease, injuries, and maternal and child health? The US office of the International Association of National Public Health Institutes (IANPHI), housed in EGHI, has worked with local ministries of health to build and develop surveillance and other public health capabilities in some fifty-five lower-resource nations. When Ebola raced across West Africa in 2014, those countries were able to respond more quickly, restricting spread and lowering deaths. And more "CDCs" are in the works. "Having IANPHI's US office housed in the Global Health Institute has been a great partnership," says Courtenay Dusenbury, director of the US office. "We have access to US funds including the Gates Foundation, the US CDC, and other major private and nonprofit partners who have been able to work with us on our goal of increasing capacity to national public health institutes." Emory medical students working in the Haitian rural highlands saw patients who seemed to be in emotional distress. Any question about depression, however, was met with blank stares. Back at Emory, the students collaborated with anthropology and public health student Bonnie Kaiser on a successful proposal to EGHI. In 2010, they returned to Haiti with Kaiser and the team's MD-PhD psychiatry adviser. They worked with local providers to adapt US depression screening questionnaires to Haitian language and culture, and conducted training with community health workers in how to identify depression and anxiety and refer people to Partners in Health, one of the few programs in the country providing mental health care. "What's unique about the way EGHI funds these projects is that it really brings together not only multiple disciplines, but multiple schools," Kaiser says. "It's really novel to have that available to students, where you have a funding source that can actually bring together students from widely varied disciplines and work on the same project."